Everyone knows Love Actually is the greatest Christmas-themed romantic comedy of all time, and through its popularity, fans have come up with some interesting theories about the film. You'd think after watching the movie hundreds of times we'd have similar thoughts, but surprisingly, these theories took even us by surprise. They'll certainly make you want to watch a little more closely during your next rewatch. Below, five fan theories about Love Actually that actually make a lot of sense. Fan Theory #1: Mia is the "devil" and Rufus is the "angel." It's no surprise that everyone hates Mia, and her antagonism is pretty blatant when she struts into a formal party in a devil costume. But to fans, this scene wasn't meant to be a metaphor. According to them, Mia is a literal devil whose sole purpose is to try to ruin Christmas for Harry (Alan Rickman)'s family. And because no good/evil story is complete without an angel, fans believe Rufus is an angel whose role is to save Harry's marriage. In fact, this theory was proven to be half-true by the writer himself who said Rufus was an angel in the original script but got changed at the last minute! Fan Theory #2: Mia is actually not "evil" but is the saddest character in the film. On the flip side, some fans don't see Mia as the devil at all. Instead, they see her as the most sympathetic character in the movie. According to this theory, she aggressively pursues her boss Harry, who's much older than her, because she has deep, lingering daddy issues. Fans have also pointed out that whenever the character is shown at her home, she's always alone as if she has no friends. And in the scene when Harry visits her on Christmas Eve, she's alone again (on a holiday, nonetheless). Considering Mia is new to the company, fans think her aggressive pursuit of her boss is to fill an empty void in her otherwise lonely life. Definitely makes you think. Fan Theory #3: Daniel (Liam Neeson) is in love with Karen (Emma Thompson). While Karen spent the majority of the movie dealing with her tense marriage with Harry, fans noticed that her good friend Daniel had eyes for her. According to a Twitter user, during a scene where Daniel meets model Claudia Schiffer, he forgets her name and calls her "Karen," presumably because his true love is on his mind. This is fans' favorite theory, however, when asked about it in an interview, Liam denied it. “She’s my sister. That is sick," he told reporters. "I can’t believe you said that. She’s my sister!” Liam must be overdue for a rewatch of his own movie cause Daniel and Karen are not siblings! Fan Theory #4: Annie, the prime minister’s chief of staff, is responsible for pushing David and Natalie together. Although the movie hints that Annie dislikes Natalie (she makes a rude comment about Natalie's weight), according to this theory, Annie is actually the main reason why David and Natalie end up together in the first place! At the end of the movie, his staff leaves him a stack of Christmas cards to go through. Considering he's the prime minister and gets thousands of cards, the stack his staff leaves behind must've been prescreened. Could Annie have intentionally left Natalie's card, the one in which she confesses her love to David, in the pile on purpose so David could see it? This is one theory we definitely believe. 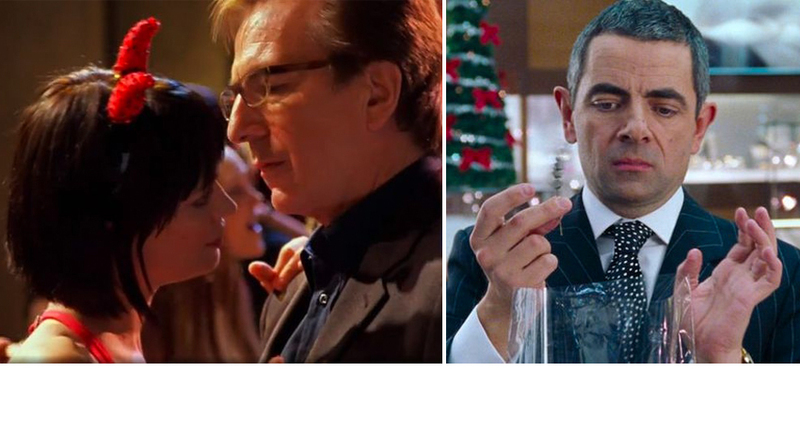 Fan Theory #5: Love Actually is a movie that resents being a "holiday movie." Although it's probably the most famous Christmas movie of all time, a Reddit user thinks the movie has a subtle anti-holiday and anti-consumerism message. "Love Actually the movie wanted to be written as a movie just about love but had a Christmas theme shoved into it so that it would sell better, we see evidence of this throughout the film," they wrote. They cite two examples, one being the Billy Mack character messing up the lyrics to his love song that he was told to market as a Christmas song to get more money. His second example is the Christmas play at the end where a bunch of sea creatures are shoved into it for no reason, which hinted that the film was making a mockery out of stories that have ridiculous things forced into them with no purpose. We see where they're coming from, but it's a bit of a stretch for us. We'll definitely have to look closer during our next rewatch! The Kardashian Kids Stole The Show This *Kristmas* And We Loved Every Minute Of It!